Free iPhone app “Monstermatic” allows kids, and the young at heart, to design – and 3D print – their very own monsters. Los Angeles based startup Mico Studio introduced Monstermatic last year. This free iPhone and iPad app gives users a fun and easy way to design monsters, and 3D print them. This app features ten animated monsters, with swappable parts including hats, horns, eyes, and other scary features, and allows children to create, interact with, and share their monsters with their friends through social media. Mico Studio initially launched the Monstermatic app on Kickstarter and received over $30,000 in funding – enough to complete the final stages of development. Since its launch in 2013, Monstermatic has grown in popularity. While some studios encourage the purchase of 3D printed versions of game characters as a way to add life to the game, Clayton Mitchell, founder of Mico Studio says that with Monstermatic, creating the character IS the game, giving the players the freedom to create their own character. The monsters are customizable and are able to be 3d printed – even for those without access to a 3D printer! 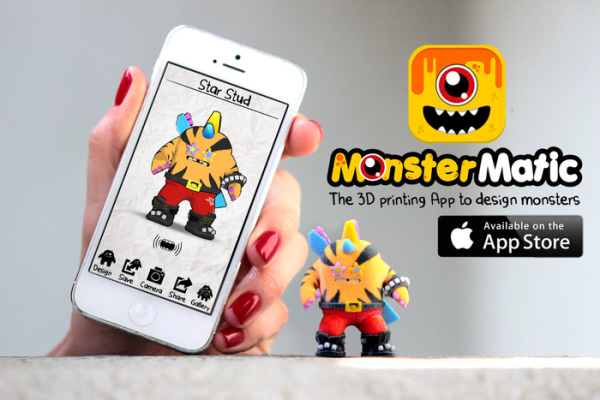 The Monstermatic app is fully integrated with Shapeways. Just send your creation to print and you will receive your figurine in the mail. A full-color 3D printed 2-inch monster figurine costs $25.95. Users say that snapping photos of their virtual monsters in real life situations is one of the best things about the 3D printed figurines. The Monstermatic app is available free for a limited time.